Another seal tester sold today! The JentonAriana seal testers are ideal for rejecting individual gas flushed packs (ie meat / bread / pasta) at the point of packaging - so the contents can be re packaged rather than being rejected later and thrown away. This is a very popular concept with the guys at WRAP! In addition, the end customers have less problems with mouldy goods due to poor seals! Call 01256 892194 and ask for info! Supermarkets getting the banding message.. Finally....the concept that banding is THE way to package innovatively and sustainably is sinking in!! We have two big supermarkets (we can't say which ones) looking at banding in film and/or paper for a variety of tasks. Bands can repace outer cartons or hold packs onto a shelf ready tray so that shelves can be filled quickly and efficiently with minimum transit waste being generated (see photo). we can now print digitally onto the banding material so each band is unique and bands can double up as labels - or even provide the whole package. With spring onions, for example, the band holds the onions together and acts as the label. See Jenton's Banding Website for more information. We've booked a stand at the Easyfairs HVAC exhibition in Brussels, Belgium on 23/24 September. This will allow us to showcase the UV disinfection equipment from Sanuvox in Canada and, of course, the Vibration Analysis equipment we make in C-Cubed (our main market for Pocket Vibra is for HVAC fans and pumps). Sanuvox is the leading company in North America manufacturing UV sources for air disinfection and UV disinfection of AC coils, ducting and filters. 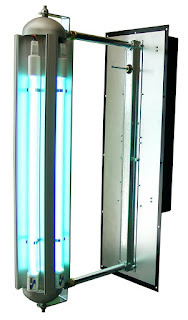 Sanuvox's patented "Biowall" multi-lamp system allows high intensity UV to treat large airflows with minimum disturbance to existing ducting as all lamps are in line with the flow. In trials at McGill University and published in 'The Lancet', Sanuvox air disinfection UV reduced "sick building syndrome" in offices by up to 40%! Yesterday I visited a fabulous facility at Lincoln University's Holbeach Campus - the 'National Centre for Food manufacturing - Training and Research Centre' Lincoln Uni website Mike Dudbridge, the Principal lecturer theere has done a fantastic job in rasing funds to build a state-of-the-food-art research centre to latest food factory standards. There are a number of official parners, such as Multivac, Baro, Ishida, PPMA etc. and there's even a whole food packaging line including multihead weigher, tray sealer, weigh price labelling and various inspection systems. Employees of food companies and other interested parties can sign up for degree courses in a number of relevant subjects for part time/full time/ distance learning and it's a really good resource. We've got a new building! we now have our 4th building in Whitchurch, hants. "Unit 13" is mainly for storage but it realeases space in our "Unit 6" which has been developed as a showroom for Jenton's packaging machines and Packaging automation and also contains our UV Curing workshop with loads of UV curing lamps, conveyors, UV radiometers and testing equipment. Now we hope that potential customers can come down and really try out our UV kit before committing to purchase. 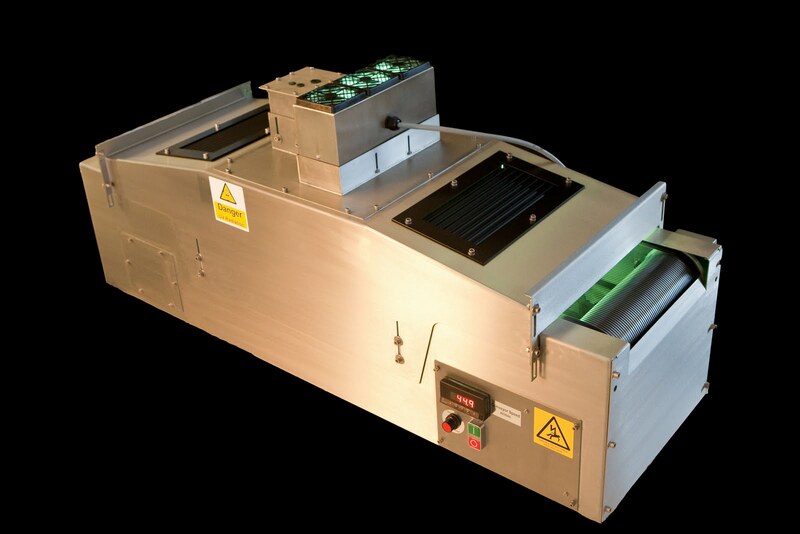 We even have some competitors' UV curing equipment there for comparision. Well, the exhibition season is over and we've now finished with IPEX, MEDTEC, TOTAL/PAKEX/PPMA, Irish Packaging and Packaging Innovations. We've shown off all the latest technology in banding and UV curing and we've tried to tell everyone that we actually analyse and give them what they want rather than just sell boxes. Hopefully the message is sinking in - certainly we have lots of leads to follow up. UV Curing has been good for us recently as we've launched a load of lamp systems that we actually design and make here rather than sell on behalf of other people. The flexibility this has given us is amazing - we control the controls and the specs and we can use the really good AMBA UV Cure bulbs! www.jentonuv.co.uk is now extended to be www.jenton.com also. Exports here we come! !